The final day started like any other. Since the fever, he had been in and out of it. Sometimes talking a little crazy, but most of the time still there and even getting out of bed to use the bathroom and shower. One of the things they don't tell you is if you buy burial spots etc before death, it is cheaper than to do it after. My Dad had decided it was probably best if I went and finalized details since we could tell the end was near. He had gone with other family members to look at funeral homes and cemeteries but wanted me to make the final decisions. Making these decisions is so hard because you don't want to be making them at all. We started at the funeral home and I had to finalize casket details etc. Then we moved onto the cemetery. I had never known till I Ray, he wanted to be buried in the wall and not the ground. I am glad he chose this because going to visit with the girls so little, has made it more bearable to be indoors especially in the winter. Even deciding on this detail there are so many options. Which building, what floor, what height, where in the building, room for 1 or 2 caskets? Who knew there were so many options? I had a lady from the cemetery drive me to the building and decide on a place. I chose a spot overlooking the library and park because he loved kids and I knew he would want to be facing those things. The girls also know exactly where he is from the outside and whenever we drive by they wave and throw kisses to him. When we returned to the main office to sign papers and finalize details I will never forget what the lady said to me, she asked if I wanted a single or double casket space and then followed it up with well you are young and pretty so you never know where life will lead you so a single is probably best. I will never forgot those words. I know in her mind she probably thought it might make me feel better, but nothing matters when you are burying the love of your life. You aren't thinking of anything but your future slowly fading away. It was one of the worst things I remember hearing while he was sick. As I was signing on the line to finalize the details my phone was ringing and it was Ray's brother Samy. My Dad was like you should probably answer and he all he said was you should probably get home. I knew at that point he had probably died. Instead of breaking into tears I almost smiled because if anyone knew Ray they knew he would save a buck whenever he could and he literally waited till I was signing on the line to die. One of my greatest fears was being there when he died. I absolutely didn't want to be around when it happened. I almost felt like he waited for me to be out of the house and saving a buck. When I returned home his whole family was there and they had already taken all the tubes out of him and cleaned him all up. He finally looked at peace for the first time. I remember being so incredibly sad but at the same time at peace that he finally wasn't suffering anymore. All those tubes, and medication, and being all skin and bones laying in that bed day in and day out. After I said my good byes the funeral home took his body away. The hospice came in and took away the bed and machines and my mom had a friend's son that owns a carpet cleaning company clean all the carpet. The next day everything was set back up in the room as if nothing had ever happened. It was eerily quiet, but for the first time in months I was able to relax without worrying when he was going to die. I was missing in action again on the blog since the girls were off school for mid-winter break. We spent one night in Frankenmuth for Summer's birthday, but mainly spent the week at home doing low key things. Summer is a homebody and prefers to be home, but Lily likes to be out and about like me. Since we were home I did find some time to shoot a few things I had been wanting to shoot for the blog with the girls. 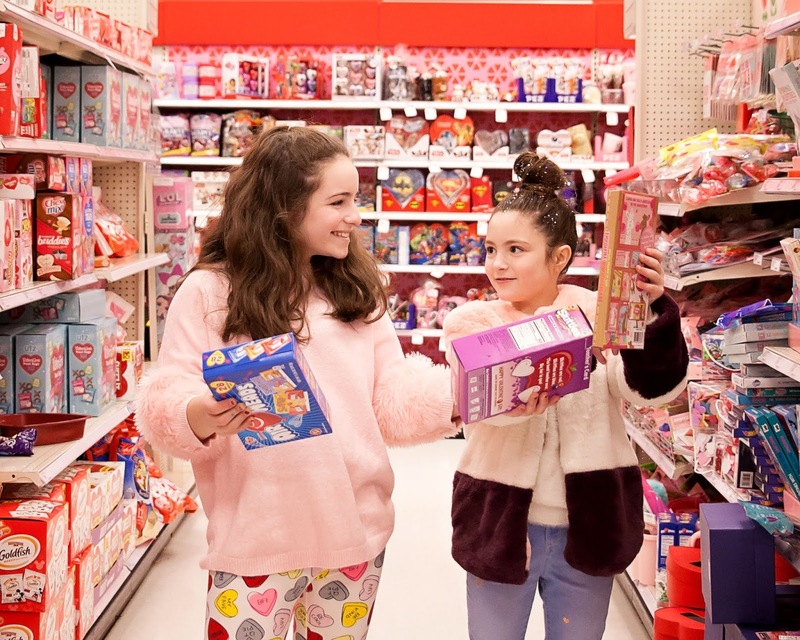 I frequently get asked where I shop or find things so I hope these posts are helpful for ideas on where to buy clothes for tweens. I am constantly finding cute things in the smaller sizes and it makes me so sad that they have outgrown that stage. My girls are complete opposite in terms of what they like to wear and will wear. 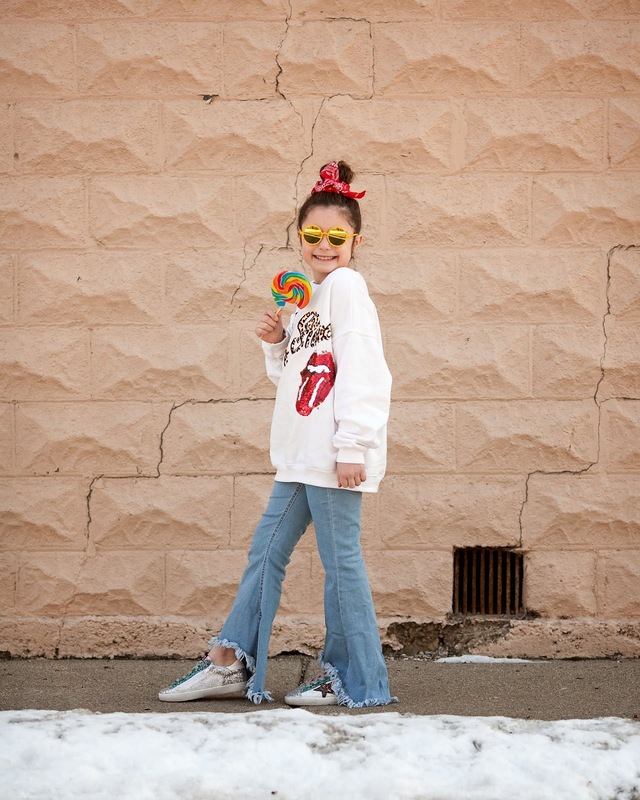 Lily is my carefree little hippy child and loves to stand out and is unique in her style. 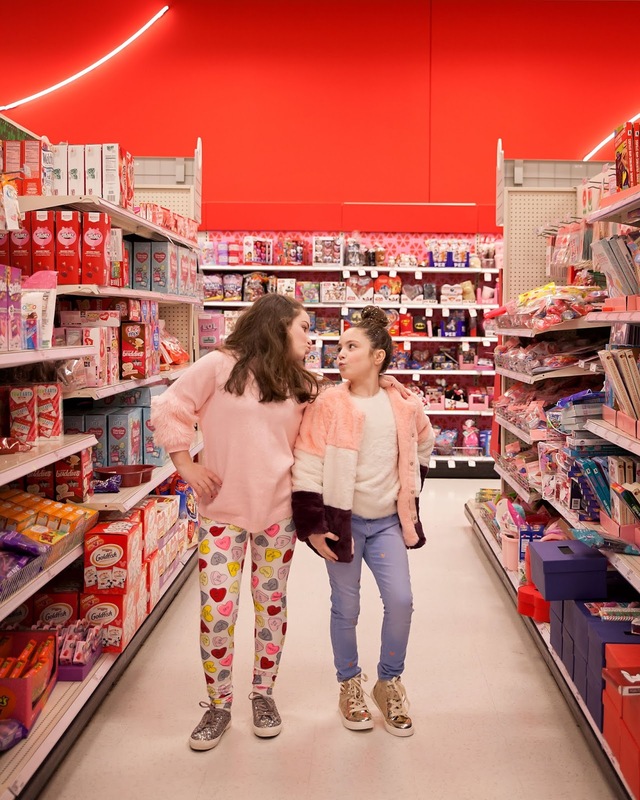 I love shopping for her or with her because she is more like me. We prefer trendy items and pieces that others don't have. She was worried when one of her favorite stores opened in the area that other people would now be shopping there and she wouldn't be able to anymore. Luckily for her, I haven't seen many wearing her stuff and she has been safe. This outfit is totally her on a casual day. She has always loved Rolling Stones shirts (I think she just likes the tongue sticking out) so she had to have this one when she found it in her favorite store. Band shirts are a great graphic tee to layer or wear on a casual day and are seen everywhere right now. 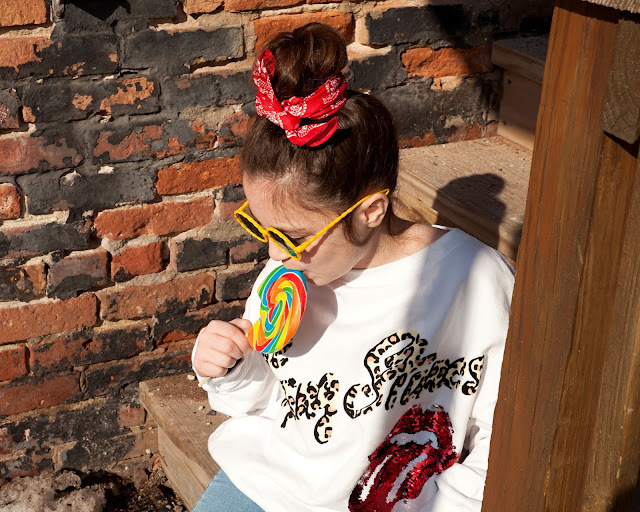 The exact one she is wearing is sold out from Zara, but I did find one to link that looks almost exact and some other band shirts. As soon as we spotted these jeans online we had to order. I mean, they are flares and will be a great jean to transition into spring and summer with a sandal. So how could we not buy these?! 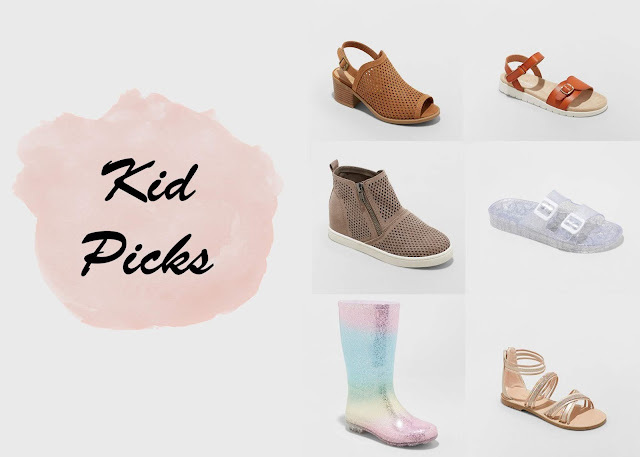 These shoes are a Golden Goose dupe for girls. She was obsessed as soon as we found them online and we had to order. We ordered her normal size in these and she loves them. They come with another pair of laces if you want to switch them to a pair you can tie, but she loves that the sides zip and she can just throw them on and zip them up without tying. They had them in a few different styles, but she loves the glitter. We haven't had any issues with the glitter falling off. As I am sitting here typing this post thinking about how sad I am mid-winter break is already over, I can't help but be excited that in a month they will be off for spring break and we will be able to make more memories. Hopefully the weather will be getting warmer and I can start shooting some spring looks soon! I have been slacking on my posts with the crazy weather and the kids home from school, but decided to do a post because it is National Caregiver's Day and wanted to talk about my experience. When Ray was sick I heard so often, "I don't know how you do it?!" To me this wasn't even a question. When I married him I vowed through sickness and health and doesn't everyone do that for someone they love? Married or not? I watch some of my friends take care of their children or a sick parent. You do it because you love them. Is it hard? Absolutely! It is the most draining thing you can do. You want so badly to make everything better and you can't. You can only help them through whatever it is they are going through. Emotionally I was a mess watching him deteriorate. You don't do it for recognition and I never wanted pity. I didn't want people to feel sorry for me...I wasn't sick. I didn't want attention for it because it was something you just do. Did I feel guilt about some of the things I did while being a caregiver...yes. I remember making him walk longer distances than he should have at times because I felt like it would keep his strength up. I made him go into the store one time with me to pick up scripts because I thought he should do something "normal". I look back and feel incredible guilt about doing these things. At the time I felt they were things that needed to be done so he wasn't giving up and would keep him strong. Now I look at it as me wanting him to have been those things at those times. Your days as a caregiver are spent taking care of that person. I remember having to be up at a certain time every day to remove his food bag or go to bed at a certain time to put it on. I had to clean tubes and bags, etc. Make multiple slurpee runs a day because that was one of the few things he was able to tolerate. I remember constantly cleaning everything, driving to and from appts, picking up scripts, and trying to be an emotional support all while struggling too. As a caregiver remember to take time for yourself. You can easily get lost in taking care of the other person and putting your own emotional needs aside. I remember huge guilt leaving town for a few days and him ending up in the hospital at the same time. I think it was a good break looking back because when I came home he was put on hospice and it just got tougher from that point. You can't take care of anyone else if you aren't taken care of. I shared these on my Instagram the other night, but decided to do a whole post dedicated to them because they are currently on sale till today!! If you spend $40 on shoes or clothes (men, women, or kids) you take $10 off. This is one of the sales I wait for to stock up. Truth be told, I was never a Target shopper for myself (clothes or shoes) but in the last year or so that has changed. With the introduction of new brands and styles I do end up buying myself stuff here and there. I like buying shoes at Target because styles change so quickly I don't like to spend too much on shoes. They also sell a lot of "dupe" shoes for a fraction of the price. The Cat and Jack brand shoes for kids have a year warranty. Last year I bought a pair for Lily that fell apart the first time she wore them and they didn't even ask any questions and just exchanged them. 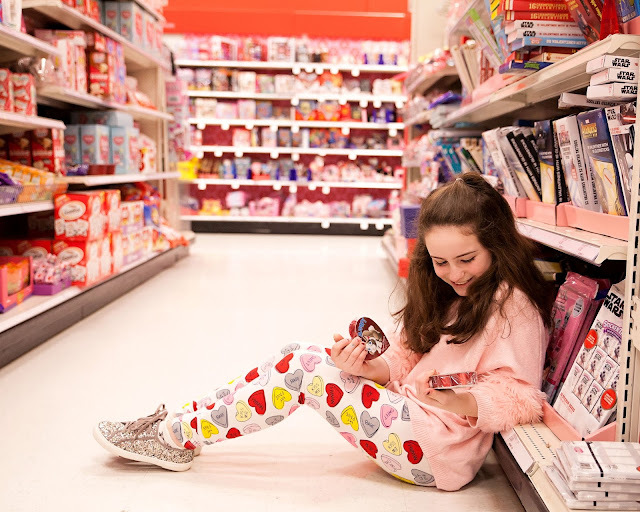 I always buy the girl's shoes at Target because they again have good prices and are usually on trend. 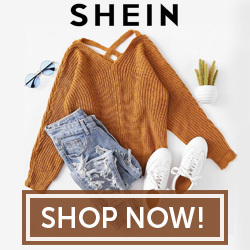 I am linking all my favorites below, all you have to do is click the photo to go straight to the item and shop! I added a few more since I did this post on Instagram last week so check the shop the post below to see all my picks! Last time I did a shoe post the boot sold out super quickly and wasn't restocked...so now is the time to grab a deal and some new spring/summer shoes before they sell out! I wanted to share these adorable pink slides that add just the perfect amount of color to any outfit. I absolutely love pairing them with an all black outfit or black and white to give it a punch. When I originally put this outfit together to shoot for this post, they were in stock at the original retailer and I had found an almost exact pair at another retailer. Now they are almost sold out from where I bought them and sold out at the other retailer. I did find some other similar pairs to link. I always try my best to shoot outfits for the blog that are completely in stock or I can find very similar items to link but this one was tough. The sunglasses were in store purchase (Target) and those I couldn't find to link anymore either. Maybe the heart and Valentine's Day attire is just selling fast! This casual Valentine's Day outfit is just my style. 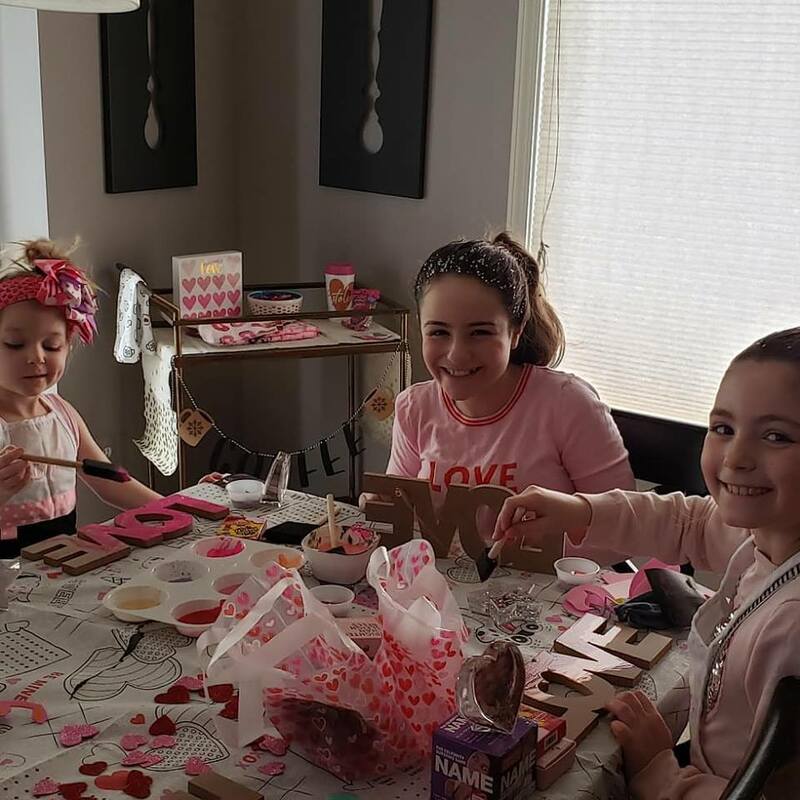 I don't usually do much for Valentine's Day besides work at my kid's party (I am always class mom) and then usually take them out. This is the perfect outfit for that kind of day. 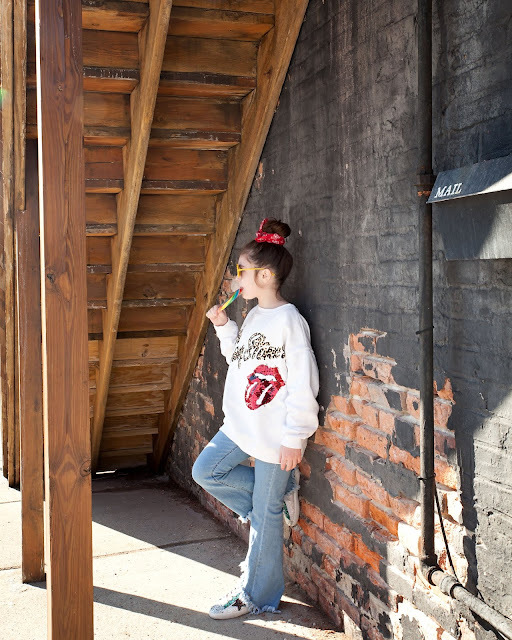 I chose this location to shoot this post because it is right in front of a new pastry shop that just opened up in Downtown Detroit called Cannelle. I planned to shoot in front of this cute Lovers Only restaurant (I mean because I am wearing a heart shirt and shooting a Valentine's Day look) and because maybe I could check out this new pastry shop after. They serve all sorts of pastries, sandwiches, and espresso drinks. While I was outside shooting one of the employees asked if I wanted to come and shoot inside the shop, which was so sweet! I ended up getting a coffee éclair and latte after my shoot and they did not disappoint. We ate them often when we were in France and it was great to find a place here that serves them! The staff was so friendly and it is such a cute shop I can't wait to take the girls back to pick out their own treats! My biggest fear when Ray was sick was him dying while I was there alone with him. I knew he was going to die, but I had this fear of him dying and I not knowing what to do. They don't prepare you for this and you never know when it is going to happen. In the beginning, I thought he could just succumb to his cancer at anytime not realizing that it slowly overtakes the body and organs shutting them down. I mean I guess you can say I did KNOW this, but for some reason I had this irritational fear that it would happen super quick. While he was in hospice my mom talked to a family member that had been through this before and she said that the hospice nurse informed them that normally the patient will spike a really, really high fever before dying. It usually is right before the body starts to shut down. One night his Mom and I found him in bed burning up. It was the highest fever I have ever seen on a person and it scared me, but knowing this was part of the process actually made me less anxious than I think I would have been had I not known this would happen. We called the hospice nurse and she told us to put cold towels on him. I remember he was talking and not making much sense at that point. The next day the fever had lifted and he would go in and out of making sense when he was talking. He did say a few things during this time though that I will never forget and I will always respect those wishes. I knew we didn't have much time at this point and it was apparent his body was shutting down. What is Spending The Night Class? Spending the night class started after Ray died and my sister would come over every Wednesday and spend the night. Summer was obsessed with school and being the teacher and they would play school every Wednesday. They would plan crafts and activities to do every week, sometimes even going on field trips. This slowly evolved into holiday parties as well. When a holiday comes around the girls plan a special class and do all holiday activities. They decorate and even dress for the holiday. They make special treats and even a few extra people usually show up. These are some of their favorite days of the year. 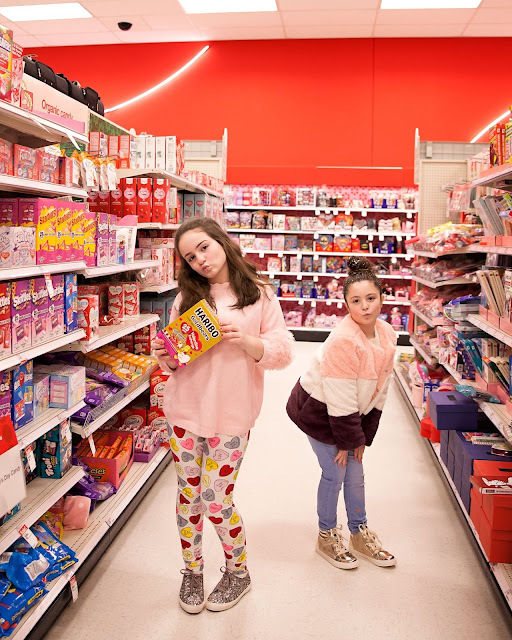 Where We Shop for the Party? 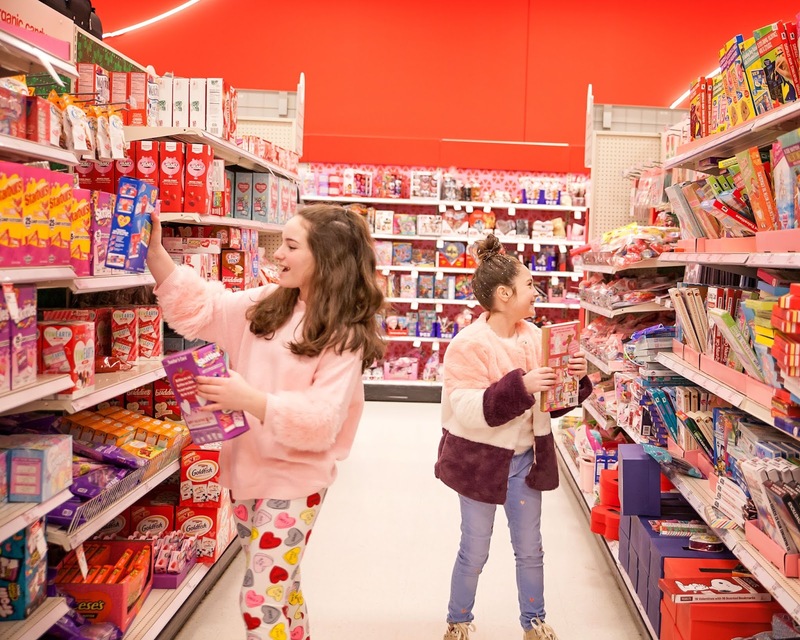 We usually buy all our party supplies in the Target dollar bins or the Dollar Store. Sometimes Walmart has cute things too! We don't spend a lot of money on supplies it is more about having fun doing them. We normally play bingo and have prizes. This is one of their favorite things! We buy cheap prizes and it is funny who ends up with what and how competitive it can get! Sometimes we will have other games too depending on what we can find that sounds fun. They usually have at least 1 craft project to do because everyone likes to craft and take something home. Pinterest is a great place to look for inspiration or sometimes just walking through the store something catches our eye to buy. 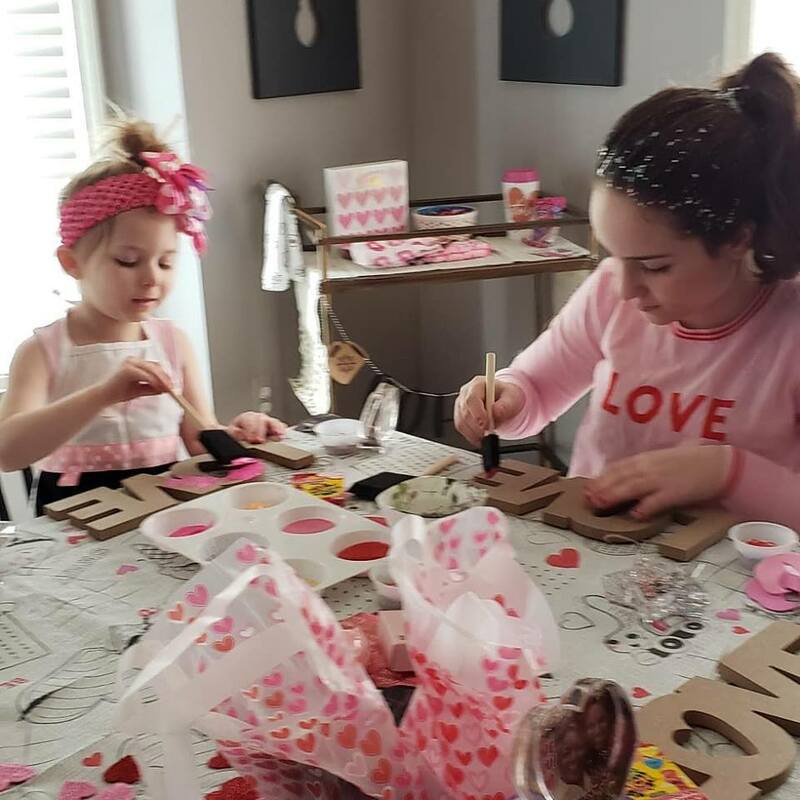 For our Valentine's Day party we found some cute LOVE signs at the Dollar Store that we thought could be painted and decorated. They all turned out so different and everyone loved them! I think this is the other part everyone looks forward to...what the treat will be! Sometimes we will have homemade treats and other times we just buy them. Sometimes special drinks are involved in equally special glasses and straws! It all depends on what we find and decide on. After Ray died I stopped throwing parties for the girl's birthdays because it was just too much work or me. I gave them a choice between going someplace for their birthday or having a party and they always chose the vacation. I think it is better money spent as well as more memories. I know in 10 years they probably won't remember who was at their 11th birthday, but will remember they went to California, etc. I always spent my birthday on vacation and have the best memories. I know that these spending the night class memories are also something they will never forget. 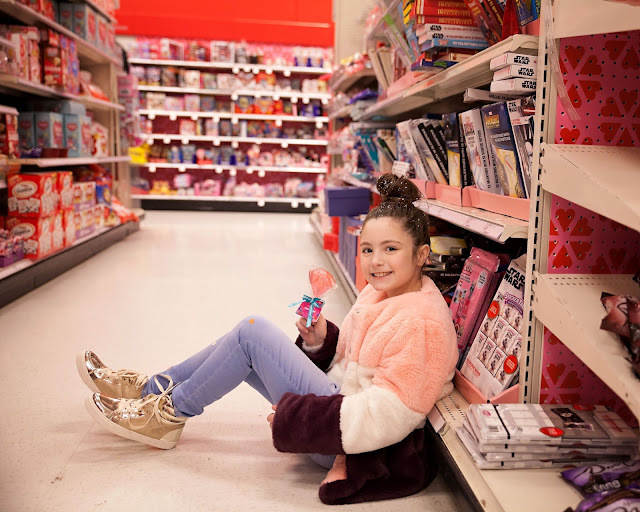 With Valentine's Day right around the corner I thought I would do a post on the girl's Valentine's Day outfits. I told them I wanted to run up to Target to snap a few pics and pick out some stuff for our Spending the Night Class party (for those that don't know what that is I am going to do a whole post on it on Monday!). Of course any excuse to go to Target and they are in. I am used to shooting in public places, but inside of one of my favorite stores made me nervous...I mean what if we got kicked out and told never to come back!? I think I snapped these in all of 2 mins and afterwards realized not one person even walked by the whole time. Afterwards I had a ton of ideas of what I could have done....oh well! I guess I will have to do another Target shoot! Summer picked a very Summer outfit. If anyone knows Summer they know she is most comfortable in leggings and tennis shoes. She is my comfy casual girl. Her shoes are now sold out online in that color so I added them in black. Her sweater was from last year, but I linked a few that they carried this year that are just as cute to wear with the leggings. Lily really wanted to wear a tutu, but we never found anything that was super cute. She ended up with heart embroidered jeans that we found on a super clearance at Old Navy and a Valentine's Day colored coat. I linked some similar jeans since hers have since sold out since I bought them. Of course she had to add glitter to her hair, which was also a Target find. I always check Target when we are looking for holiday themed clothes because they usually have the cutest stuff at great prices. I linked everything below to click and shop and some other items that we considered!